There’s always a number of graphics primitives you will be using in all kinds of projects. If you’re lucky, you’re working on a “real” platform that comes with a large number of graphics libraries that offer abstractions to the graphics primitives of the OS and, ultimately, to its hardware. However, it’s always good to know what’s involved in a particular graphics primitives and how to recode it yourself should you be in need to do so, either because you do not have a library to help you, or because it would contaminate your project badly to include a library only to draw, say, a line, within an image buffer. Lines are something we do a lot. Perfectly horizontal or vertical lines have very simple algorithms. Arbitrary lines are a bit more complicated, that is, to get just right. 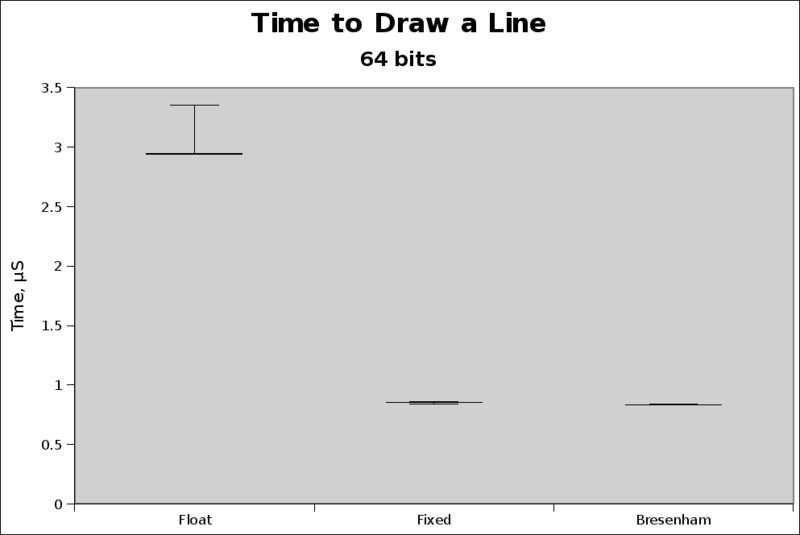 This week, let us take a look at a few algorithms to draw lines. First, we’ll discuss a naïve algorithm using floating point. We’ll also have a look at Bresenham’s algorithm that uses only integer arithmetic. Finally, we’ll show that we can do better than Bresenham if we used fixed point arithmetic. 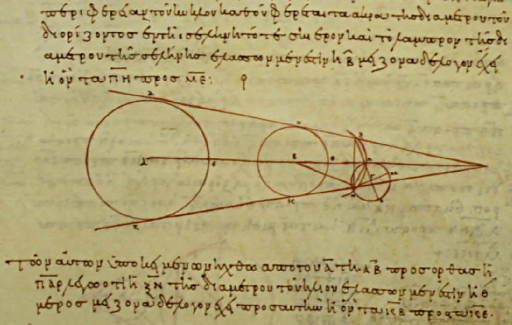 In this piece of code, we suppose that so that the line is drawn contiguously. To manage all possible , you only have two cases to check. If , the line is more vertical than horizontal, and you iterate on the rather than the , and you put instead. Since it’s not much more difficult than that, we will continue our demonstration considering only the more horizontal lines, that is, with slopes . This being said, the above code is simple, but involves the use of floating points. The compiler generated a rather long series of instructions because it tries to enforce 32-bits precision (because the internal floating point registers aren’t 32 bits but 80!) as well as dealing with the conversion of float values to integer. Would the CPU have been capable of SSE, the compiler might have generated code using the cvttss2si instruction. This instruction that converts a scalar single precision float into an integer. Since this instruction uses the XMM registers, the code is greatly simplified because there is no need to worry about precision; floats are stored as 32 bits in XMM packed registers. All that to say that all this seems like a lot of code just to perform y+=m and truncating. Jack Bresenham, in 1965, came up with an algorithm using only integer arithmetic to draw a line of arbitrary slope . Bresenham algorithm will loop on the s again, but rather than directly estimating , it will iteratively update a moving point, say , in the following way. Knowing and , will the point be above or under ? If it is under, the line passes closer to than so the next point is . If, on the contrary, it passes closer to , will be the next point. To avoid drift, the algorithm keeps track of the rounding errors as well. The derivation is quite convoluted and relies differential equations, implicit forms, and you can find a (still somewhat sketchy) demonstration demonstration here. You can find the complete demonstration in . This code is simple but has conditional jumps within the main loop —for a total of three if you count the loop itself. On processors with bad, or no, branch prediction, or deep pipelines, the code yields sub-optimal performance. Every time a branch is mis-predicted, there’s a definite performance penalty. To avoid branching, we could try to transform Bresenham’s algorithm to a branchless algorithm (that is, except for the main loop that cycles from to ). One possibility is to use the machine specific integer types to do all the work for us. Using the standard C library <stddint.h> header that provides types such as int16_t, we can create a fixed point number, one that is friendly to the machine’s natural register sizes. On 32 bits x86, those are 16 and 32 bits registers. On a 64 bits machine, we could still use 32 and 16 bits (and I’ve already explained why). Which doesn’t differ much from the other version. The naïve algorithm in float averages 4.81 µs, Bresenham’s algorithm averages at 1.84 µs, my fixed point variation at 1.74 µs. The Fixed point implementation runs about 5% faster. Which isn’t all that much, but still better than Bresenham’s; and much better than the naïve version using mixed floats and integers. The situation is similar on the 64 bits machine, but the advantage of fixed point vanishes. 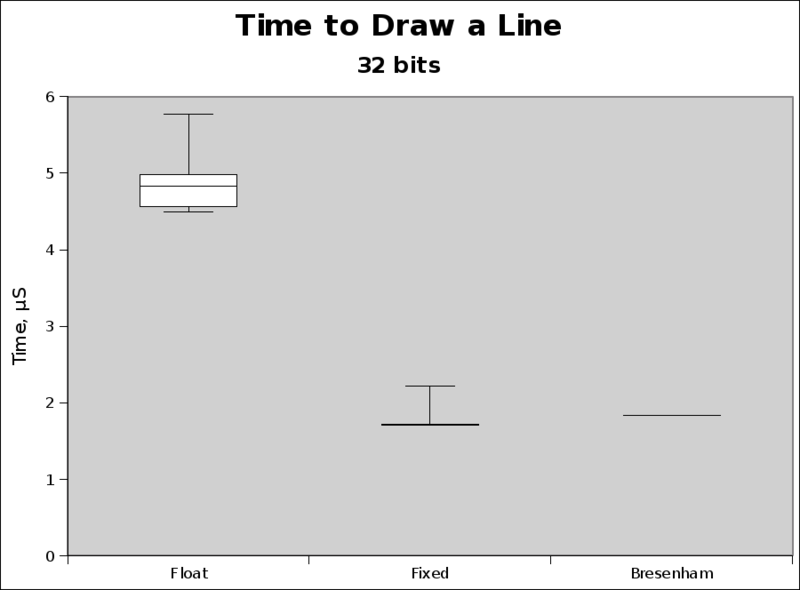 Both methods takes very similar times: fixed point averages at 0.85 µs and Bresenham 0.84 µs, a difference of about 1%. However, the naïve implementation is still very far behind, at 2.96 µs. Although the testing is far from exhaustive, the results indicates that the fixed point algorithm is very efficient. I would guess that as you go down to simpler processors, the more efficient it will be. First, it has fewer branches than Bresenham’s algorithm. Second, it is quite possible that a clever use of the instruction set and registers yield code that is much more efficient than what gcc generates—although, I admit, it seems quite efficient at times. James D. Foley, Andries van Dam, Steven K. Feiner, John F. Hughes — Computer Graphics: Principles and Practice — Addison-Wesley, 1995. This entry was posted on Tuesday, July 28th, 2009 at 5:49 am and is filed under algorithms, bit twiddling, C, C99, embedded programming, Instruction Sets, Mathematics, Portable Code, programming. You can follow any responses to this entry through the RSS 2.0 feed. You can leave a response, or trackback from your own site. 12 Responses to Faster than Bresenham’s Algorithm? Nice. Might come in handy some day. Thanks. Actually Brez’s algorithm is just a specialised version of a form of linear interpolation (sometimes refferred as digital differential). Also , the algorithm can be used for much more than just drawing lines. I have found it useful for animation, image scaling etc. I had a much improved ‘splinner’ for Wolfenstein/Doom style games that was used to draw the ‘splines’ when renderring textures (it was faster than original and allowed you to get as close as possible to walls without distortion etc). A generalised version of the algorithm is presented below that removes all multiplication/ division, takes care of all quadrants and doesent care which point is given first. It take a callback back and so can be treated as a libray funtion for anything, to draw lines you just pass in a callback to your draw pixwel function. * @return	0 if completed, any non-zero value indicates callback aborted run. * @param	cb	– Pointer to callback function. * @param	x1,y1	– Start point. * @param	x2,y2	– End point. *	function is called for each distinct point on the line. *	algorithnm at any time. *	This is my own version which appears to work in all situations. *	I looked at lots of different versions on-line and they all had minor quirks. *	and from Pascal program I wrote in 1981! if (y2<y1)	// If slope is negative y increment is -1. And yes, I have used a variation of Bresenham’s for image scaling without color interpolation (or resampling) a long time ago. I also used something (in the time of 10MHz CPUs) based on remainders to double a pixel once in a while for scaling up images. Thanks, Here is actual code I posted…. Very strange how it just dropped the centre code from the loop. The main loop is quite efficent and versions of this code ended up as x86 code in my (very old) Wofenstein clone. Thanks again, Tim. WordPress isn’t all that smart with code. You may enclose your code between [ sourcecode language=”thelanguage”]…code in thelanguage…[ / sourcecode] (without the spaces). Shouldn’t y(x) = y1 + m.(x – x1)? Otherwise we are ignoring the translation along the x-axis.